Hibs defender saw a volley crash off the bar, only for the assistant referee to award the goal. Paul Hanlon was as bemused as everyone else that his Easter Road ‘ghost goal’ was awarded in Hibs’ 4-0 thumping of Dunfermline. With ten minutes remaining of the tie, Hanlon strode forward to connect with an Isaiah Osbourne cross that ricocheted off the bar and away to safety. Hanlon had his head in his hands as he jogged back to defence when the linesman indicated for a goal – despite television pictures showing the ball had landed well outside the line. Speaking to Hibernian TV, the Scotland Under-21 captain said: "If you saw my reaction I was pretty sure it wasn't over the line. "I went away gutted that it hadn't gone in and it wasn't until I turned back around and everyone was jumping on me. "It was strange but I'm delighted the goal was given." The win, secured by an early goal flurry from Matt Doherty, Eoin Doyle and Garry O’Connor, sent the Pars down to the First Division and will allow Hibs to turn their attention to the Scottish Cup final on May 19 – after they complete their SPL duties away to Inverness this weekend. While the fans may want to see the stars wrapped in cotton wool for the big date with city rivals Hearts, Hanlon hopes the strongest team runs out at the Tulloch Caledonian Stadium to keep the team’s momentum going. 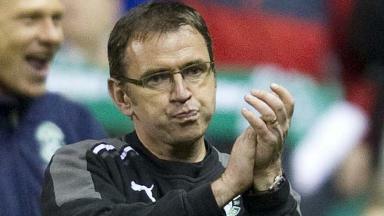 Hanlon added: "If you start taking your foot off the gas it's hard to get back up for the final. "We'll be going up there trying to get a win. We've won twice up there this season already, there's no reason why we can't do it again."